Shop Markstaar today for aluminum bleachers. 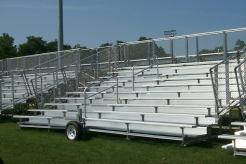 We are a leading designer and distributor of many styles of metal bleachers for every aluminum bleacher application of spectator seating imaginable. Expert product planning, site measurement, design consultation and installation are intricate and necessary custom aluminum and metal bleacher services we gladly provide.